Frogs all over the world are in serious trouble! 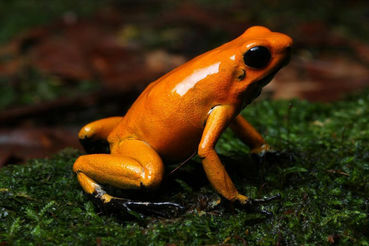 Many zoos are holding small populations of frogs which no longer exist in the wild. Those of you who criticize zoos should know this--we're often "the ark," so to speak. I hope these little frogs are safe, but zoos which provide captive breeding populations can help replenish species when/if the situation improves. Thanks for sharing! World Land Trust is superb direct action conservation organization. Interesting looking guy too! Posted in groups. Thank you Cal for the news at site, This is quite distressing that all of these Creatures that are a Gift from God to the Earth are sadly going extint. Though, I wouldn't want to run across one of these cutie little fogs, I still would like for them to exist on our Planet! This cutting down all of the Forest for Mankind's Greedy Nature is so out of Hand it is extremely sad ~ for we are leaving future generations absolutely Nothing Special except for Flat Land, Shopping Centers and CONDOS...Nothing Special in that! Thank you Val for posting this in the Group, would of gotten to Cal's News but, was running behind and caught this with your GROUP and Petitions! Great GROUP! Noted , they look beautiful but I would not like ti live near them , thanks !! Thanks for the info Cal.